Cryptocurrency is becoming more popular in recent years. It’s even becoming more popular in the world of online gambling. Almost all the casinos now accept crypto and there are even some crypto based casinos. The most popular types of crypto people use are Bitcoin, Ethereum, and Litecoin. 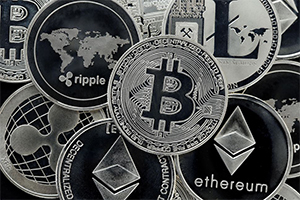 Essentially you’re able to make a deposit to your online casino with one of these cryptos. Typically it’s going to be Bitcoin, as Bitcoin is the most popular. A lot of people in the gambling world have become interested in depositing with cryptocurrency to their online casino because there are usually some awesome bonuses. For example, online gambling vlogger, Bet Meister, states in one of his videos that if you deposit with crypto you can even get a 50% match bonus in some cases – that’s a lot of dough!! Like with any bonus though, make sure that you read the terms and conditions. You don’t want to get put onto a bonus that will never let you withdrawal. If you really start to peel back this onion, it makes sense for online casinos to accept crypto. For starters, most of the people who own crypto are essentially gambling in a way. The price of crypto is very volatile and who truly knows about the future. You’re taking a big risk - just like in gambling. So the demographic of someone who owns crypto is very similar to someone who would play online casino. Second, there’s a lot of people who own crypto who only deal with crypto. They don’t have any USD or Euro – just straight crypto. These people would have to exchange their crypto for USD or another currency if they wanted to play. By letting them just deposit with their crypto, it’s a much easier process to get them gambling at the casino. It’s not gonna vanish anytime soon. It’s only going to get bigger. Prepare yourself!!!! Just kidding! Take advantage of the bonuses though!